Hey everybody — it’s Sue from The View from Great Island, and I’m so excited to be posting here at SHK! I live and blog in Los Angeles, California, and I’m absolutely spoiled rotten when it comes to fresh fruits and veggies — I’ve got a ton of great ideas to share with you, so let’s get right to it! 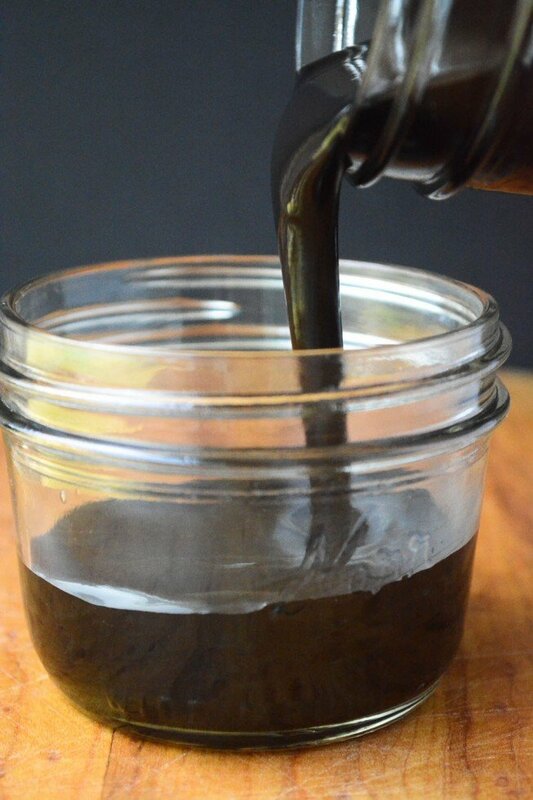 The easy chocolate dip can be made well in advance, and I recommend making extra because you’ll use it for ice cream sundaes, milkshakes, and instant chocolate milk, too. It’ll keep quite a while in the fridge and it’s simple to make. The main difference between it and the store bought stuff is the lack of unpronounceable ingredients. In fact there are only four in this recipe – cocoa powder, sugar, vanilla, and cornstarch! The color and flavor of your sauce will vary depending on the type of cocoa powder and sugar you use, so you can customize it to your taste. If you like dark chocolate, look for a Dutched process cocoa, like Hershey’s Special Dark, it will give you a nice deep rich result. That’s what I used. As for the sugar, coconut sugar is a more natural choice than refined white sugar, but it will give the sauce a slight coconut flavor. Use regular sugar if you want to re-create the store bought syrup exactly. 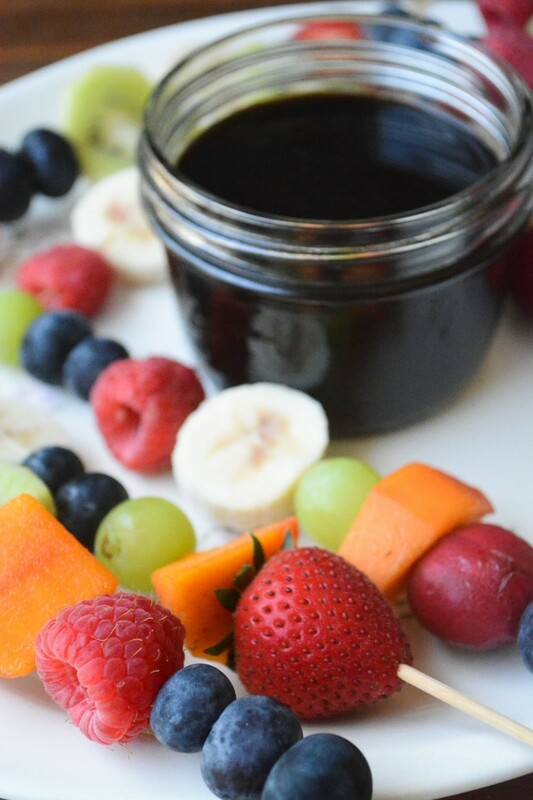 The sauce is really yummy all on its own, but in this case I’m using it as a clever way to entice the kids to eat fruit for dessert. As for fruit, the sky’s the limit. Use whatever looks good at the market. You can cut it into chunks, or use small fruits like grapes and berries whole. This is a good way to introduce kids to new and unusual fruits like starfruit, kiwi, or mango. Get them involved, too — let them assemble their own skewers — they’ll get an impromptu lesson in colors and patterns while they’re at it. When you let kids get creative in the kitchen, you’re laying the groundwork for better eating habits for the rest of their lives. If you like, snip off the sharp point from the picks after they’ve been threaded with fruit to cut down on accidental impalements! 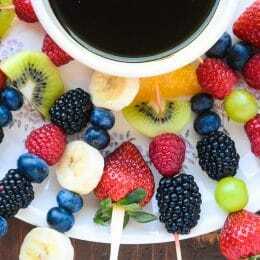 With soft fruit like bananas, strawberries and kiwi you could also use popsicles sticks. In hot weather I like to freeze the fruit. 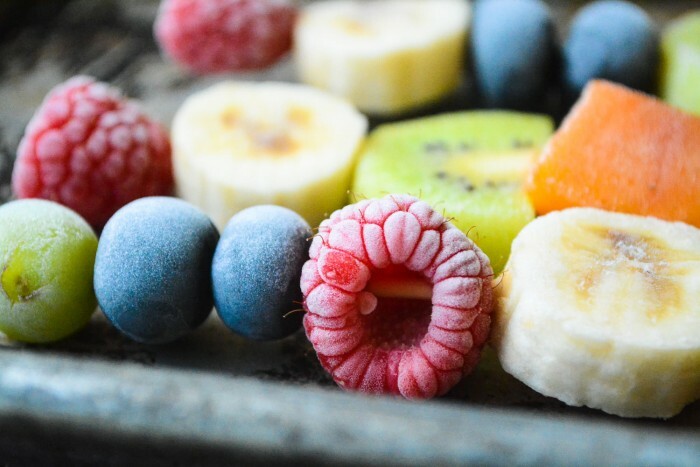 Just be aware that some fruit freezes harder than others and could be difficult for little mouths to chew…bananas, kiwi, grapes, and small berries are all good choices. Bananas in particular freeze up with a texture that feels just like ice cream! Wash and dry your fruit, and peel if necessary. Create your skewers and then lay them out on a baking sheet. Put the sheet in the freezer and freeze until firm. Bring them out just before serving. 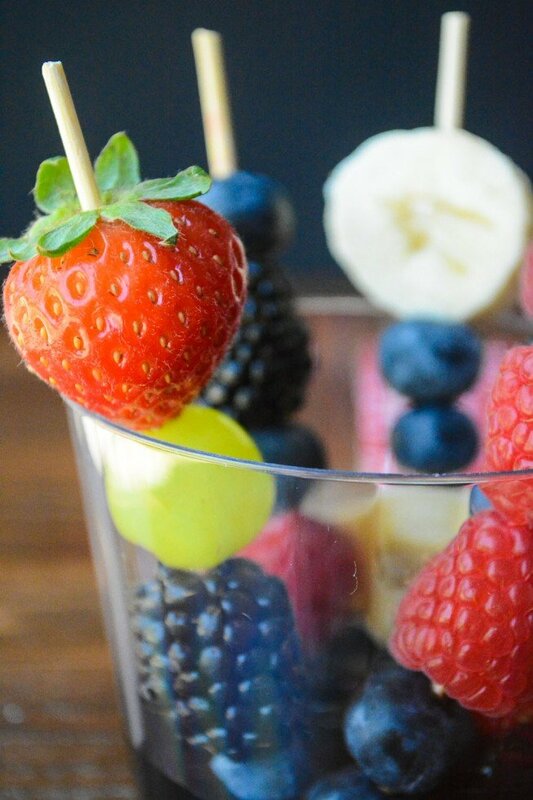 If you want to create individual, portable desserts, just spoon a little of the chocolate into small plastic tumblers and arrange a few skewers of fruit inside. Cut the bamboo skewers down to a smaller size with scissors if necessary. You can find Sue over at The View from Great Island, where she’s busy cooking up all kinds of fun in her kitchen. Follow along on Facebook, too! Put the cocoa powder and the sugar together in a small saucepan, and then whisk in the water. Heat the mixture on medium heat, stirring, until it is smooth and comes to a simmer. Stir in the dissolved cornstarch and continue cooking until the syrup thickens a bit. Take off the heat and add the vanilla. Note: The cornstarch thickens the sauce and makes it more ‘dippable’, but you can leave it out if you like, for a thinner sauce. Let the syrup cool before using. You can store it for quite a while in the fridge. 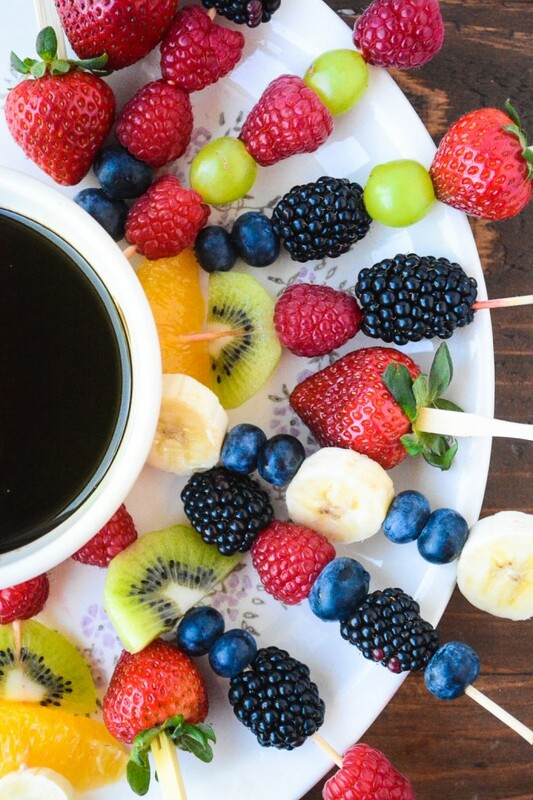 For the fruit skewers, wash the fruit and peel, if necessary. Slice the bananas and kiwi. 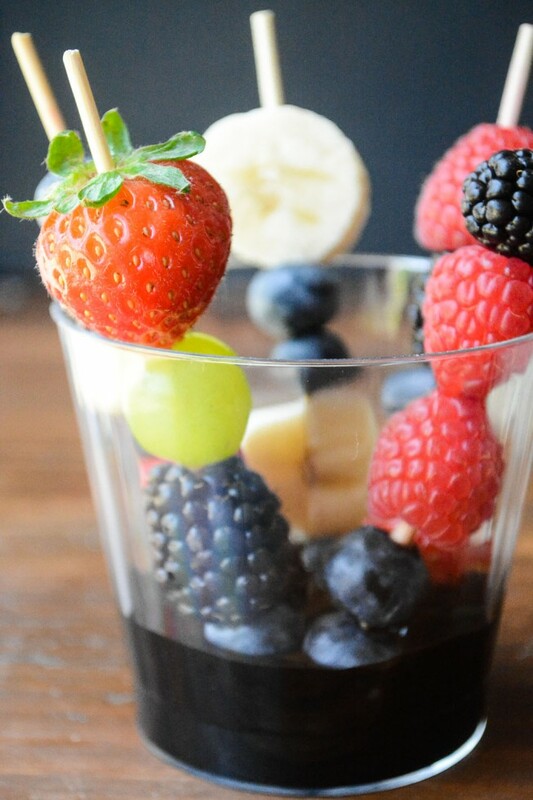 Cut larger fruit like melon and pineapple into chunks, and leave berries whole. 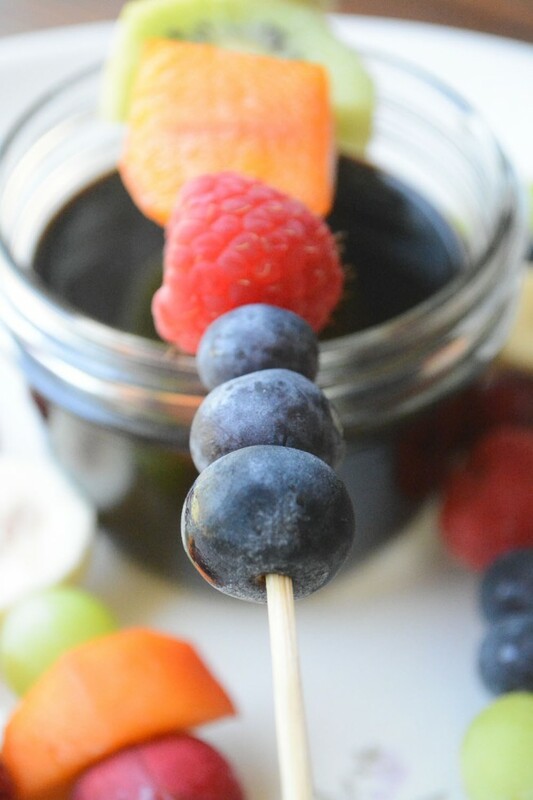 Thread the fruit onto bamboo skewers. If you are serving to small children, snip off the pointed ends after you have assembled them. 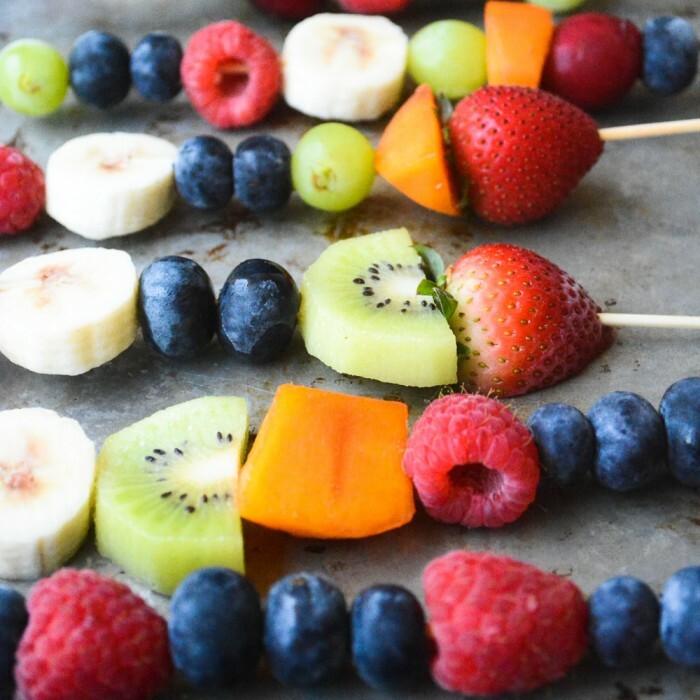 If you would like to freeze the fruit, assemble the skewers and then place them on a baking sheet. Set the whole pan into the freezer and freeze until firm, this will take several hours. Remove the skewers shortly before serving. Note: For freezing use berries, grapes, banana and kiwi. 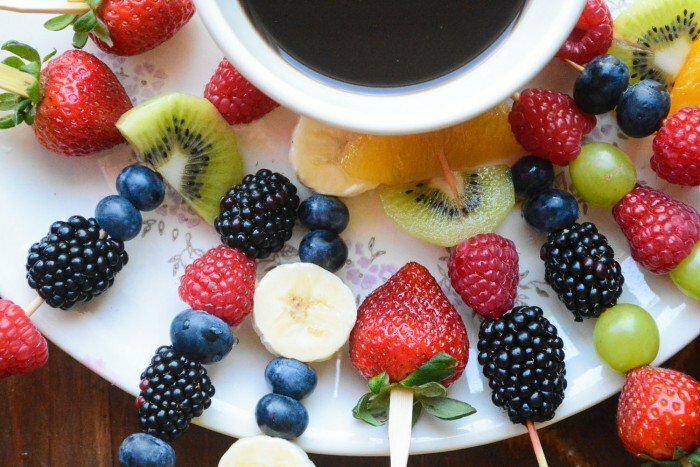 My two kids avoid fruit like the plague – I’ll have to try this! For me, fruit’s already dessert LOL! I’ve never stopped being a kid! So this is perfect for me. 😉 Really fun stuff — thanks. Fantastic idea and gorgeous photos! I will make this for my grandson (because I want to eat it too) but we knew that 🙂 Great post Sue. Fruits are a tasty storehouse of nutrients. There are many reasons why fruits should be an essential part of your toddler’s diet. We list out five such healthy fruits.